Comic fans knew that Deathstroke would be beaten sooner or later... but nobody expected a 'religious awakening' to finish the job. Strange as it may sound, the tale of DC's deadliest assassin following his "Rebirth" has taken an unexpected twist, bringing Deathstroke face to face with the kind of spiritual awareness and epiphany reserved more for monks than murderers. It's a transformation that marks the beginning of a "bold new era" for the character - and he won't be fighting on the side of good all by himself. The story itself has spun out of the crossover event "Lazarus Contract" (which we'll catch readers up on momentarily) but the real direction has now been set with Deathstroke #21. As odd as it may be to see Slade Wilson quoting Bible verses and renouncing murder, the fact that he's recruited young heroes like Kid Flash himself to his new team shows DC isn't kidding around. 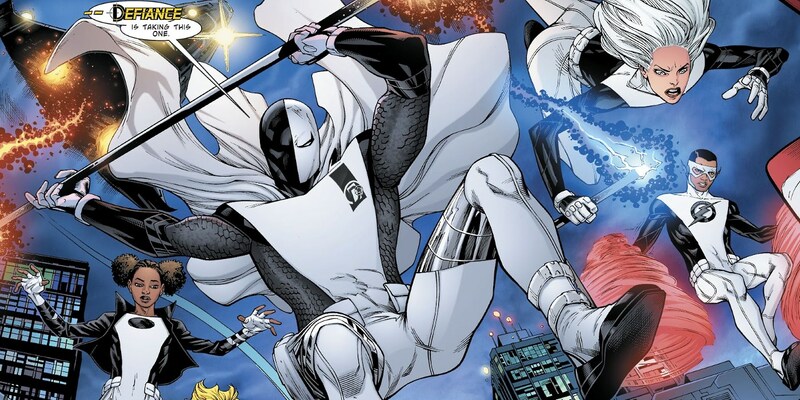 The age of "Defiance," Deathstroke's righteous, black-and-white clad strike team has begun. As promised, this crisis of faith (or discovery of it) in Slade's life requires some explanation. By now, most comic book fans know that the DC Comics "Rebirth" has seen many heroes, teams, and even villains return to their roots: begin new stories inspired by their classic arcs, reignite old rivalries, or in the case of Deathstroke, regain awareness of their lives prior to the New 52 reboot. And in the long history of Deathstroke the Terminator, his debut as an enemy of the Teen Titans is where his character made the most memorable splash. It was "The Lazarus Contract" that saw Deathstroke's son killed, and Slade hold the Titans responsible. So it was only fitting that writer Christopher Priest send Slade out for revenge once more in his own "Rebirth." At least, that's what the story seemed to be. As the issues released, however, Slade's true plan was revealed: use new speed-stealing technology to absorb the Speed Force energy of both the original and New 52 Wally Wests. His endgame was to travel back in time and rescue his son, but as every speedster can attest, he spun out of control traveling farther and farther back... eventually becoming one with the Speed Force. The Titans succeeded in pulling him back out, but the damage was done. Slade Wilson - a famed pragmatist, killer for hire, and borderline nihilist - had seen and joined the fabric of the cosmos. Dropping his mask where he stood, he announced his retirement - that "Deathstroke is finished." 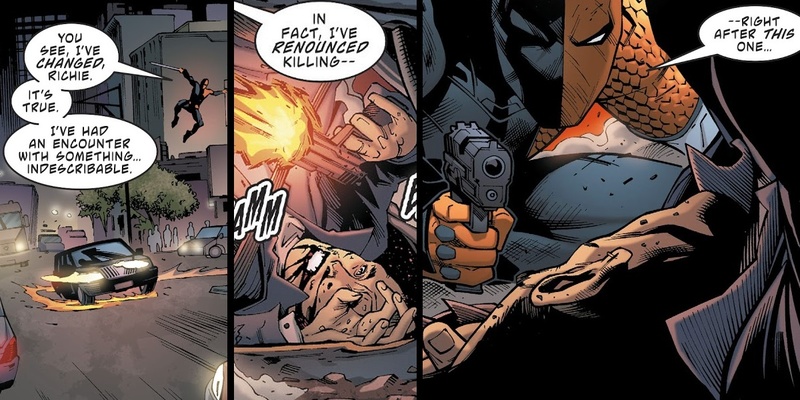 Deathstroke was alive. 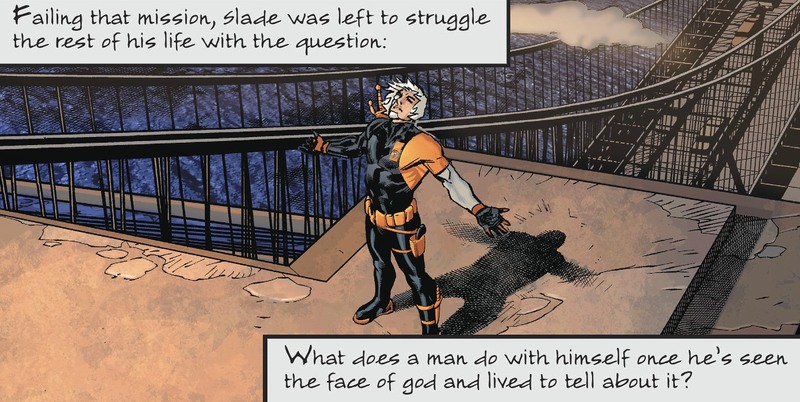 He hadn't expected to be... Slade was left to struggle the rest of his life with the question: What does a man do with himself once he's seen the face of God and lived to tell about it? The world's deadliest assassin was a shadow-man. The darkness empowered him. The sun was, at best, an annoyance. But now, it was as if he'd never noticed the sun before or felt its warmth. As if he'd never BREATHED. Born again. The scenes that follow continue the connection to "born again" Christianity, with Slade seeking forgiveness from Tanya Spears (DC's new Power Girl) by quoting scripture stating that she, as a faithful Christian, must forgive him. When asked if this newfound spirituality is a sign that Slade has embraced Christianity, however, the famed killer makes it clear that he's not that simple. Calling that simple assertion "ridiculous," he confirms that his "experience" has heightened his awareness to the same extent the government enhanced his physiology. Issue #21 finds Slade in search of an international crisis on the scale needed to test his assembled "team" with their first mission, just one last kill away. A limousine driver responsible for dealing deadly drugs to gives Slade a chance to state his new morality: he kills the driver to escalate an international standoff... but he won't take the money he normally would for the contract. With the limo driver's diplomatic employer viewing the killing as aggression from foreign powers, a potential hostage crisis turns hostile. American lives are on the line, and Deathstroke - somehow - sends a message to Cyborg in the Justice League Satellite to keep Earth's heroes out of it. It's time for Defiance to see what they're made of in the field: Deathstroke's team consisting of his son Jericho, his ex-wife Adeline, his daughter Rose, Tanya Spears, and Wally West. Having been kicked off the Teen Titans by Damian Wayne, Wally has swapped his yellow threads for a Defiance uniform, making him a key player alongside Tanya in Deathstroke's new role as mentor and team leader. But will these 'Dark Titans' and Deathstroke's moral epiphany be enough to resist the dark forces behind the scenes? We'll have to keep reading to find out. Deathstroke #21 is available now.